We are so grateful that Natalie is a good little sleeper. 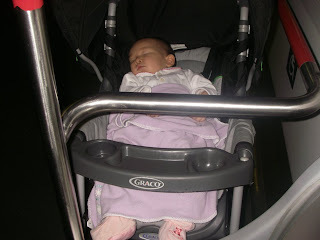 We can take her out all day and she will happily nap in her stroller or sling. Here is Natalie asleep on the MTR (subway). She sleeps so soundly that not even all the people around us and the loud speakers and the "beep beep beep beep" sounds of the doors opening and closing wake her. Also, look how long she is now. Her head is at the very top of the stroller and her feet are sticking out! Who made a BIG mess?